Stars: Jason Clarke, Ed Helms, Jim Gaffigan, Bruce Dern, Kate Mara, Clancy Brown, Jim Fiore, Olivia Thirlby. This engaging historical docu-drama is a cynical study of corruption, ambition, power, the power of celebrity, the abuse of power, and family. 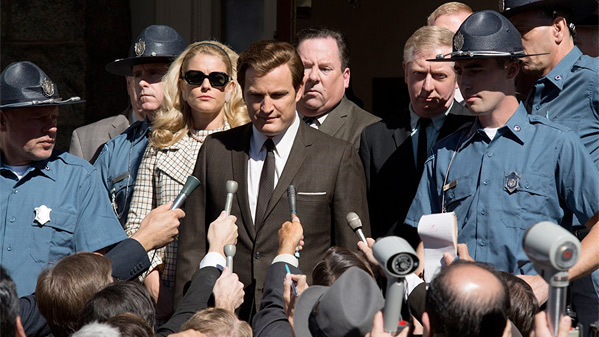 Chappaquiddick centres around the scandal that surrounded Senator Ted Kennedy and the tragic drowning of political staffer Mary Jo Kopechne in 1969. The incident almost cost Kennedy his political career and certainly derailed his ambitions to become President. The charismatic Edward Kennedy (played here by Australian actor Jason Clarke, recently seen in the disappointing haunted house drama Winchester) was the youngest son of the Kennedy dynasty and the only surviving son. There were lots of expectations on him to continue the family’s celebrated political legacy and tradition. But his ailing father Joseph (played by Bruce Dern, from Coming Home, etc) thought him a lightweight, a disappointment and that he lacked substance. In July of 1969 Kennedy and a group of staffers and close advisors were spending time on the island of Chappaquiddick, off Massachusetts. He left the party early with Kopechne. But he crashed his 1967 Oldsmobile Deluxe into the river after driving off a bridge. Kennedy managed to escape from the car, relatively unscathed, but left Kopechne behind, trapped in the car. Kennedy failed to report the accident for nine hours, and his failure to alert the authorities led to Kopechne drowning. The film follows Kennedy as he tried to shape the story by manipulating the media and ensuring that his account of the tragedy gets coverage. His team of advisors, including Robert McNamara (Clancy Brown) and family friend and advisor Joe Gargan (Ed Helms) orchestrated the subsequent coverup as Kennedy tried to control how the media reported the story, portraying him as an innocent victim of fate. The story was also slightly overshadowed by the historic moon landing that week. In the end it didn’t seem to permanently damage his political career or reputation as he went on to win re-election to the senate and went on to become one of its longest serving senators. Chappaquiddick is a procedural drama that has been based on the 6000-page official forensic inquest into the incident that was publicly released in 1970. The script has been written by first time feature writers Andrew Logan (a producer who has worked on a number of films) and Taylor Allen (an editor and animator who has worked on tv shows like The Simpsons, etc), but the film tends to steer away from several controversial issues. One is left to wonder why it has taken so long for this story to make its way to the screen, and also we are left to ponder how much of what happens here is actually true and how much is supposition. The film has been directed by Australian filmmaker John Curran (Tracks, etc), who replaced original director Sam Taylor-Johnson. His direction is measured and he gives the film a dark, sombre tone. Chappaquiddick is not exactly a flattering portrait of the late Kennedy. He is depicted here as a flawed character and a master of manipulation and shrewd judge of reading people. Clarke is well cast as Kennedy; although he only bears a vague physical similarity to the famous politician he manages to capture the essence of this flawed personality and his sense of entitlement. He delivers a layered performance that captures his mannerisms, and he suffuses his portrayal with a sense of self-doubt as he realises that he may never become President, and he explores his weaknesses and political savvy. Clarke previously worked with Curran on the 1998 drama Praise, and he seems to get the best out of his leading man. Kate Mara (from tv series House Of Cards, etc) has a brief role as the doomed Kopechne, but we learn little about her and are unable to really feel any sympathy for her character. Helms is better known for his comedic roles in films like The Hangover trilogy, but here he delivers a more dramatic performance as Gargan, who wrestles with his conscience over the coverup. Clancy Brown has a formidable presence as McNamara. And an almost unrecognisable Dern plays the wheelchair bound Joseph Kennedy the judgemental and unforgiving family patriarch. He only has a couple of lines of dialogue, but he convincingly manages to contort his face and body to capture the debilitating effects of a stroke. Chappaquiddick has been shot by cinematographer Maryse Alberti (The Wrestler, etc), who gives the film a nostalgic feel, with the burnished palette reminiscent of some of those classic paranoid political thrillers from the late 60s and early 70s. As a footnote, it is interesting to note that this incident inspired Brian De Palma’s tense 1981 political thriller Blow Out.